REMARKS: USUALL YENCOUNTERED INDIFFERENT STYLES AND CALIBRES. The weapon operates on a simple blow back principle. The bolt is drawn to the rear by its grasping lug, fastened to the rear end of the bolt. The bolt will be held in open position by the sear. The sear engages the bolt face and holds it this way until the trigger is pressed. When the trigger is pressed, the bolt moves forward, picks up a round, loads it into the chamber, and fires it. 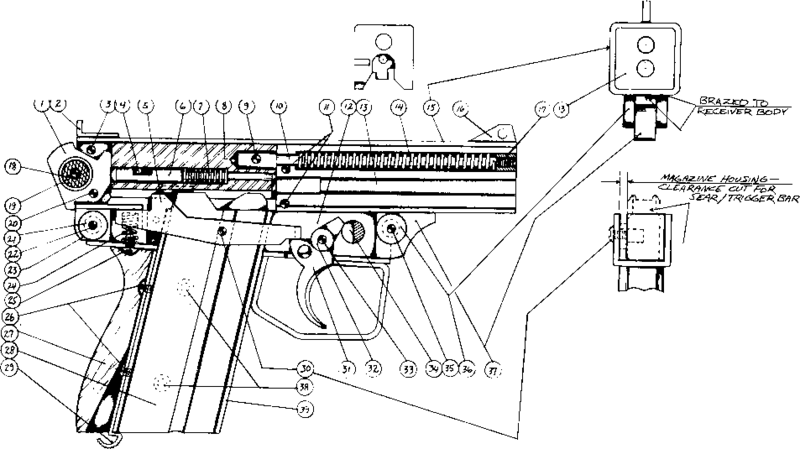 The system ensures that the cartridge has been fully housed into the chamber before the hammer hits the firing pin. The underside portion of the hammer will press against the rear of the receiver tube where the bolt is contained during the last 1/16 inch of the bolt closing. This contact of the hammer and receiver is transmitted to the firing pin, igniting the cartridge. The weapon will continue full automatic fire until the trigger is released or the magazine empty. The receiver is a simple square tube 1 1/8x1 1/8 inch or larger, depending on the size of the weapon or calibre. Slots to accommodate the magazine, ejection slots, and a slot for the recoil control screw head are cut. The recoil control screw prevents further backward pressure of the slide during operation, because the recoil spring may not have sufficient strength to stop overtravel of the bolt. This screw will also prevent the bolt from flying out of the receiver if the recoil spring guide nut accidentally disconnects from the bolt. The recoil spring is a cut down Ml carbine recoil spring. (Any similar spring used in .22 autos will do). It is housed in a hole just above the muzzle hole and is integrally drilled to the barrel stock. 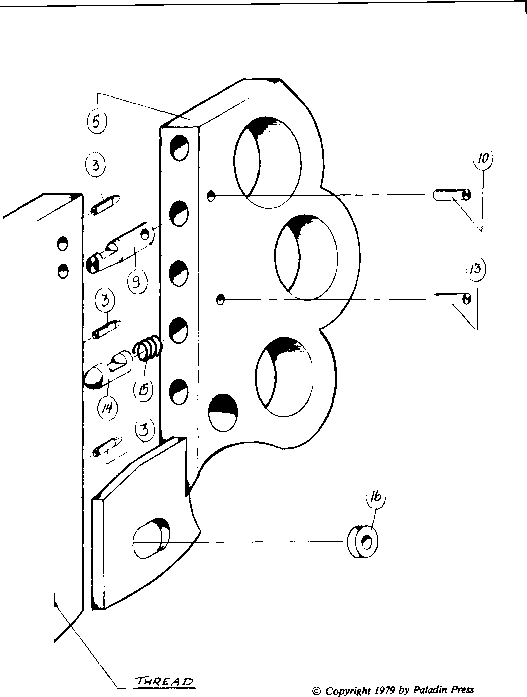 The trigger housing and magazine housing are both formed from 1/16 inch steel sheet and brazed or riveted together in place to form a simple frame. The magazine used is from the AR-7 Explorer .22. It is best suited because of its built in feed ramp. This means that the barrel can be built easier without the provision for feed ramp. If the 15 shot magazine is to be used, file a notch aligned to the magazine catch with the magazine fully inserted. File the magazine hump on the right side of the magazine body so it can be inserted freely into the magazine housing. The ejector can be riveted or brazed to the left side of the receiver only. This will permit a cut out or clearance to be cut on the right side of the magazine housing before riveting or brazing it to the trigger housing. This clearance cut will accommodate the sear. 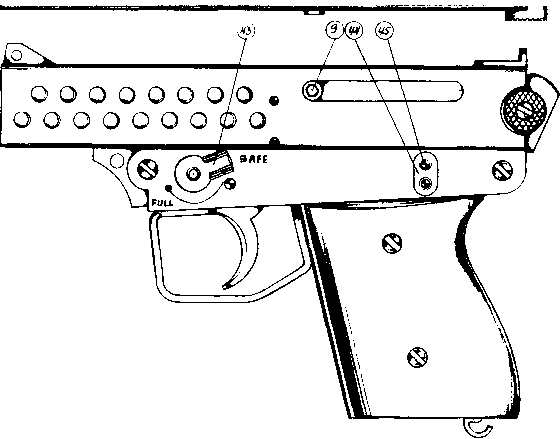 The sear is held in place by a screw which is connected to the right side of the trigger housing frame only. The safety lever is retained by a plate on the right side of the trigger housing and in turn secured by the barrel pivot screw nut. The lever contains the index ball and spring for type of fire setting. Two lugs are brazed to the front and rear underside of the receiver tube to connect the receiver to the trigger housing. Both lugs (if possible) must be as thick as the width of the magazine housing. This eliminates the use of washers to conform with the space inside the housing. A spacer can be used on the trigger since the most practical trigger thickness is 1/4 to 3/8 inch. 28. Magazine (std. 8 rds. AR - 7Explorer .22 cal) also 15 shots available. Hl sf/t ce* j at/nso To »cc/eue/i /èiM cvJ<JecTitJC iUG. How to make a homemade single shot pistol (22 cal)? How to industri homemade trigger? How make homemade guns and weapons? How to make a homemade nucklegun? How to home made mini machine? 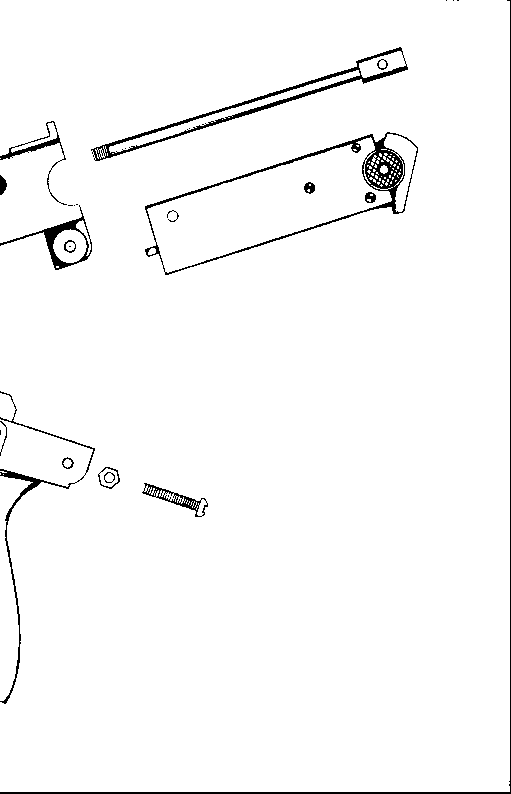 How to made pistol diagram picture? 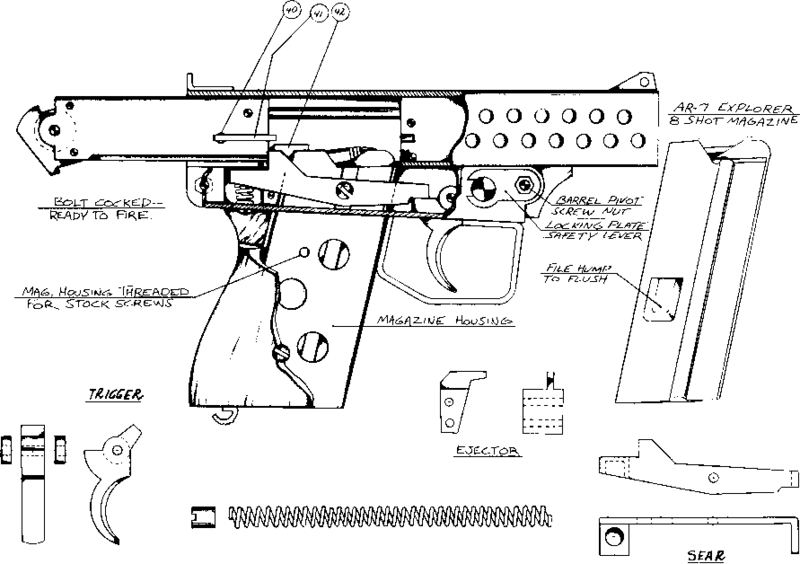 How to make homemade single barrel pistol diagram?